Nanette Rudge, nee Rigby, was born on 25 October 1935 at Exeter, England, the daughter of Harry Parkinson Rigby and his wife Elizabeth, nee Appleton. On 14 February 1976 at Sydney, she married fellow Alderman Barrett Leslie Lewis and they had one son and a daughter. Nanette Rigby was educated at Totnes Girls Grammar School in Devon. From 1968 to 1972 she was the manager of the Kings Cross Waxworks in Sydney and, from 1970 to 1972, was president of the Kings Cross Chamber of Commerce. 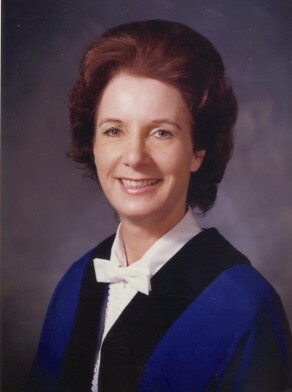 She became Information Centre manager of the Sydney Cove Redevelopment Authority from 1972 to 1975 and promotions manager of Grace Brothers Insurance from 1975 to 1977. From 1977 she was the director of branches for the NSW Division of the Australian Red Cross Society. She was member of the Australian Journalists Association, city Tattersalls Club, and the Fitzroy Committee. She lived at Roseville Chase. Barry and Nanette Lewis were awarded the Medal of the Order of Australia (OAM) in the General Division in 2007. When she was elected as Alderman for Flinders Ward on 21 September 1974, Nanette Rudge was the second woman to be elected to Sydney City Council. She served until 16 September 1977 and was re-elected for Fitzroy Ward from 17 September 1977 to 19 September 1980. Rudge was a member of the Finance Committee, 1974-77, the Community Services Committee, 1974-80, the City Health Committee in 1978 and the City Health and Engineering Committee, 1978-80. She was appointed Council’s representative on the Organist Selection Committee 1977, was a member of the Maritime Services Board Foreshores Building Committee of Advice in 1978 and served on the Committee set up by the Standard Association to prepare standards for Noise Pollution in 1977. She initiated Council’s recycling program in the 1970s and was concerned for the welfare of the Kings Cross and Darlinghurst communities. She was a member of the Civic Reform Association. She also served as an alderman on Ku-ring-gai Council.